Frank takes Pia Postman hostage on live TV, threatening to execute her after she accepts the blame for his daughter's suicide. 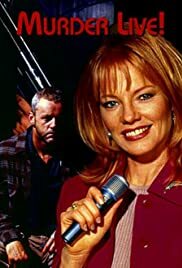 'Murder live' is a unique film. Never before has a movie been so accurate in its depiction of questionable-quality TV talk shows and the very unfortunate events they can cause, as has recently been proved in real life. Even more impressive, is the fact that it is a TV-movie! Roger Spottiswoode and the actors (especially David Morse, Marge Helgenberger and Peter Horton-who also wrote the script) have done a terrific job. Shot in real time, in "live" TV broadcast style (that brings to mind the notorious Jerry Springer show), it never misses its target and also covers other issues such as police corruption and the indifference of the public (who would rather watch baseball). Well made, fast-paced and shocking, 'Murder Live' is a film that really gets you to think and deserves recognition as one of the greatest modern achievements of TV -and there's not many-. Don't miss it!